Poured wall or shotcrete walls provide the cost effective and versatile solution to wall protection and retention. Shotcrete protects and strengthens natural earth batters as well as covering sheet piled walls. It’s the perfect solution for builders and developers who want finished walls without the unavoidable costs and delays in shutting down a work site for the carting and installing precast concrete. Leading property developers and builders trust ASP to deliver a high quality service up to three times faster than conventional products. 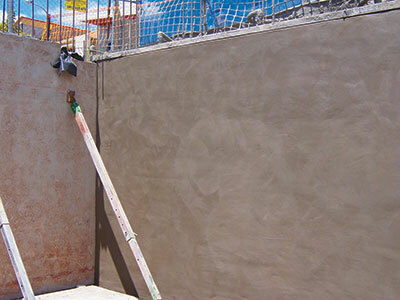 Shotcrete delivers concrete via a high velocity hose, quickly coating the wall surface. The method of delivery ensures that walls, including corners, are fully covered two to three times faster than concrete block walls or precast concrete sections. Unlike alternative forms of wall surfacing, the shotcrete method used by ASP does not require heavy equipment such as cranes that can shut down an entire work site for days. Spray concrete walls also help developers maximise floor space. 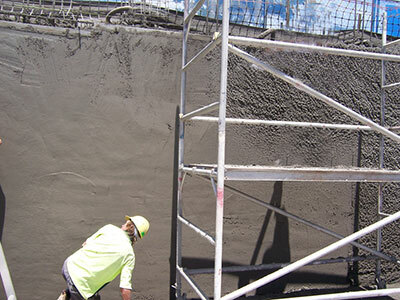 While concrete block walls can be up to 500mm thick, shotcrete walls are just 100mm thick. Maximising basement space improves the value of the property. This method is also ideal for free form structures and curved walls where pre-cast and cement blocks are unsuitable. In areas where waterproofing is required, spray concrete can also be pumped onto walls covered with waterproofing membrane. Speed and Convenience: Shotcrete walls go up fast without the on-site delays associated with pre-cast walls. Cost-Effective: No need to hire cranes and other equipment, or shut down sites for days, as with other types of wall surfacing. Space Saving: Up to 80 per cent thinner than concrete block walls, maximising a property’s saleable space. When finished, shotcrete walls create space savings that can add to the value of a development. Applied over sheet piling, shotcrete affords an excellent finish.